No one would ever want to experience a home invasion. This is a scary ordeal that can be avoided with proper protection. 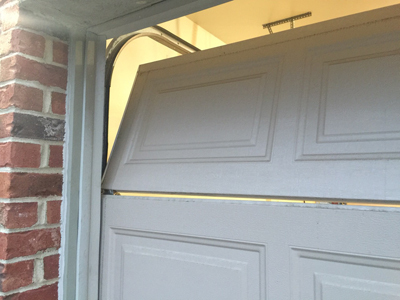 Garage Door Repair Mendota Heights wants you to remain safe while in your home. If your garage is attached to your home, a thief can enter your home through your garage. This is especially true of homes with roll up doors. It only takes a skilled burglar seconds to break into your home. This can easily be done with every day items. The burglar can use something as simple as a coat hanger or long wire, to trip your safety release system. They stick the hanger or wire through the door to pull on your emergency release handle. This releases the safety latch and then they will have access to your garage, thus gaining access into your home. Since most people do not lock the door leading into their home from inside the garage, it is easy for a burglar to come right into your home. Even if you do lock the door to your home, it would still pose a serious threat to your safety if someone were able to get into your garage. There are some easy steps to that you can take to avoid a break-in. It may be somewhat of an inconvenience for you but at least you’ll feel safe while you’re in your home. Run a thin wire or cable tie to the hold in the lever. Pull the wire tight and attach it to the carriage assembly. If your carriage assembly doesn’t already have a hole, drill one. This will make it difficult for a hanger or a piece of wire to simply pull down the lever to gain access. This is the easiest way to avoid a break-in. However, it will be somewhat of an inconvenience to you. In the evenings, when you are locking up, you can make the emergency release inoperable. That way the lever can’t be compromised. The cord connected to the release lever is easy to catch a hold on with a piece of wire of a hanger. To avoid this simply remove it from the lever. In the event that none of these techniques appeal to you, just remember that we are always here to assist you if someone has broken in or if there has been an attempted break-in. It is important that you call us right away in order to secure the premises. When you consult with our experts, they will discuss additional security options that are available to you. We even have high security locks, which can be installed on the inside of your garage door. You may also want to discuss the installation of a better home security system. We aim to provide every homeowner with the peace of mind they deserve.